Quick Couplers are the high-performance option for Cat Equipment. Couplers allow one man to change work tools in seconds for maximum performance and flexibility on the job site. One machine can move rapidly from task to task, and a fleet of similarly equipped machines can share a common work tool inventory. Wedge type quick coupler maximizes productivity without sacrificing the breakout force of the bucket and are available in hydraulic and manual. Quick Couplers allow change from one work tool to another in a matter of minutes; switching between applicaitions is fast and efficient. 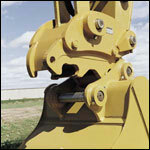 Bucket tip radius does not change when using the Quick Coupler; breakout force of the machine hydraulics is unchanged. Rugged construction employs highly resilient steel capable of withstanding severe applications. All work tools used with this coupler require dedicated coupler hooks. Blank hook assemblies are available to retrofit existing work tools. The backhoe pin grabbler quiick coupler allows the operator to quickly and easily pick-up a wide variety of work tools to perform a variety of tasks. 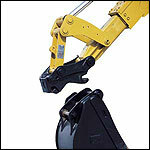 Manual pin-grabber for backhoe work tools includes one set of pins and hardware for attaching to one work tool. Features a "grab and engage" mechanism to ensure a tight tool fit, even after years of use. Ensures a "locked" mode for secure engagement of pin-on work tools. The Pin Lock dedicated coupler pins onto the stick, allowing the machine to pick up new and old style competitive work tools that have Pin Lock style pockets. These tools include buckets, hammers, rippers, and augers. A comprehensive range of buckets and brackets are available to meet any work tool need. The Pin Lock system is a hook and pin type interface and features a locking mechanism to ensure a secure fit, even after years of use. Buckets and tools with the matching interface can be changed in about one minute and require one pin to couple tools into place. The Tilt Lock Coupler uses the same mechanism and adds a hydraulic tilting function. Any bucket or work tool can be angled precisely to position it as the work demands; a key feature in backfilling, ditch cleaning, grading and sloping operations. Pin Grabber Plus Quick Couplers multiply the versatility and utility of Cat Excavators by allowing them to pick up and use virtually any work tool equipped with standard pins. The Pin Grabber Plus Quick Coupler allows machine operators to change work tools in seconds without ever leaving the cab. Quick coupler design can engage buckets from Caterpillar and many other manufacturers such as Daewoo, JCB, Kobelco and Hitachi. Pin grabbing design allows the Coupler to pick up nearly anything equipped with standard bucket pins without requiring modifications. An integral lifting eye can be used for lifting material without a bucket attached, increasing the maximum lifting capability of the excavator. The Pin Grabber Coupler can engage standard buckets in a reverse direction for front shovel and trenching tasks. Integral mechanical locking bar automatically engages behind hydraulic wedge for positive tool retention. Quick Couplers increase the versatility of Cat excavators; allowing the ease of changing work tools to meet job requirements at hand in a matter of minutes or seconds. Dedicated quick coupler buckets have no loss of tip radius, and develop maximum breakout force. The Dedicated Quick Coupler system increases job site efficiency by allowing one machine to perform a variety of tasks, switching work tools on demand. Buckets can be shared across a fleet of machines without requiring down time for changing. Dedicated Wedge Lock Couplers do not change bucket tip radius; full breakout force is available at all times. Wedge style locking system provides positive hook retention. Automatic wear compensation keeps work tools coupled tightly at all times. A wide range of compatible coupler-ready tools are available, including buckets, thumbs, rippers, grapples and rakes. Adapter hook sets can adapt nearly any work tool to work with the coupler, including buckets, shears, pulverizers, material processors, and plate compactors. Couplers are available in both hydraulic and manual versions. Hydraulic couplers engage and disengage in seconds from the cab (3-5 minutes for manual couplers). All work tools are fully compatible between versions. Upgrade kits and hydraulic kits are available to convert manual couplers to a hydraulic configuration. Couplers are fully compatible with all Cat bucket thumbs. Cat Mini Hydraulic Excavator Work Tools can be changed quickly and easily with the machine's new integrated mechanical quick coupler system. Quick Couplers for loaders provide unmatched versatility. Hydraulic model allows the operator to change attachments in seconds without leaving the cab. The manual model lets the operator lock the pins himself. Allows one operator with one machine to perform a wide variety of tasks, resulting in greater machine versatility and cost efficiency. Coupler and attachments are designed to maintain the center of gravity as close to the machine as possible. Hydraulic models allow operator to switch attachments in 30 seconds or less without leaving the cab. Horizontal locking pin system provides fast and efficient attachment changes in full view of the operator. Attachment possibilities limited only by the operator's imagination: buckets, blades, forks, material handling arms, brooms, logging forks, rakes, etc. Pins on the loader arm using standard bucket pins. 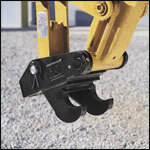 Use Integrated Toolcarrier tools on wheel loaders with the addition of an Integrated Toolcarrier-style coupler. Quick couplers offer the convenience of changing tools in seconds from the cab. Use just the tool needed just when it's needed... eliminate machine idle time. Putting an Integrated Toolcarrier coupler on a loader gives the flexibiliy of sharing tools across a mixed fleet of machines, optimizing your investment. Some IT work tools will need pockets to avoid interference with linkage on Z-bar machines. Contact Cat Work Tools Sales Support to ensure work tools will have sufficient clearance. For complete application and model compatibility please contact your Kelly Tractor Co. representative at 305-592-5360.